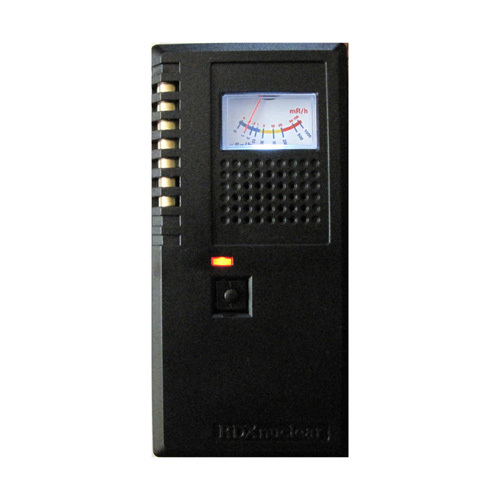 The DX-1 Radiation Monitor can instantly detect beta, gamma and x-ray radiation. This monitor emits audible clicks and while registering radiation levels on a compressed scale analog meter. At high radiation levels above 10 mR/hr, the speaker will beep, indicating dangerous radiation levels. The DX-1 has an LED indicator for battery usage and comes with an easily replaceable 9 volt battery. Visual and audible warnings are made by clicks from an internal speaker and given by the compressed-scale, analog display. An audible alarm is triggered when radiation levels exceed 10mR/hr, increasing in frequency in proportion to the radiation level. An LED indicator alerts you that meter is on and of battery condition upon each use. Detector: Halogen-quenched Geiger-Muller detector tube (gold standard) with 3 mm glass wall (density is 28 mg/cm2). Detects Beta, Gamma and X-Ray. Display: Dual Scale Logarithmic, analog meter. DX-1: 0-10 mR/hour (0-100 µSv/hr) , audible alarm above that. DX-2: 0-100 mR/hour (0-1000 µ Sv/hr) , dual scale meter. Factory Calibration: Traceable to NIST-Certified Cesium 137 gamma source. Isotopes Detected: Typical energies > 20 Kev to above 1Mev. Power Required: One, 9-Volt battery , lasts 50 hours at normal background levels. Battery Life: Up to 50 hours (button down). Red LED "ON" indicator with Audio speaker for count rate (clicks) as radiation is detected. Manufacturer's 5 year warranty on electronics and 1 year on GM tube.